Ok so I’ve been struggling for years with PC games and not being able to play them with a game controller. I think that’s why I love my PlayStation 4 so much, because it has a game controller. I bought a game controller many years ago, I think back when I still had Windows 98, and never could figure out how to get it to work. It didn’t work with any of the games I had, and the program it came with didn’t seem to help. I played EverQuest with a keyboard for 6 or 7 years and got used to it because I didn’t have much of a choice. I hated that I couldn’t use a game controller, but I learned to live with the arrows for moving my character and pressing the Q button to auto attack, I for inventory, and many more buttons and button combinations. Last year I bought Minecraft after I bought my Xbox One game controller since I figured it would work since Microsoft now owns Minecraft, but apparently that doesn’t matter since it didn’t work. It actually started to piss me off that I wasn’t able to play a simple game with a simple game controller. It’s like why don’t these things go together like Peanut butter and Jelly, or Macaroni and Cheese for crying out loud? You would think they would automatically just work, right? Microsoft Windows… Microsoft owns Xbox and Minecraft… Hello? Ok so finally today I searched and found Xpadder. It was $10 and I just happened to have $20 in PayPal, so I used that to buy it. I’m broke and that $10 could’ve been a couple items for groceries, but that lasts 5 minutes, this lasts a lifetime. Then again so does the food, am I right? So you will notice in the image above that I had to make the up arrow down and the down arrow up, and the reason is simple. If I use the right stick to look up, my screen looks at the ground and if I use the right stick to look down, you get the sky. I also bought the Windows 10 version of Minecraft (before I bought it from Mojang) and it looks at the sky if you use the right stick to look up. I don’t know why it doesn’t work right in one but not the other. Here is Xpadder for EverQuest. I’m not sure if these buttons will work for me yet. The Alt 2-4 are the spell gems and I is inventory, Q for auto attack. Ctrl X I believe is camping and Ctrl S is sit/stand. I forget what C is lol. The left stick moves my character and the right stick actually controls the cursor/mouse. I will change Ctrl X to the space bar for jumping since I probably jump more often than I camp out of the game lol. I tried running around in the Plane of Knowledge, and it was a bit tricky because I’m not used to it, but I can see me starting to play EverQuest again now that I can play it with a game controller. And any time I need to change a button to something else, I can just put EQ in windowed mode and change it, then go back to the game. Easy peasy lemon squeezy. I feel like Xpadder was well worth the $10 I paid. Sometimes I regret things I buy, but I do not regret this at all. It’s wonderful. Memory has been a huge issue with how slow my computer is because I only have 1GB of ram. EverQuest play OK, but it’s not great. Lord of the Rings Online is really bad because as I’m running through a zone or area, the screen will freeze up every ten seconds for up to a second or two which can be a bad thing, especially if something is chasing you. It can be a matter of life and death, well, for your character anyway. 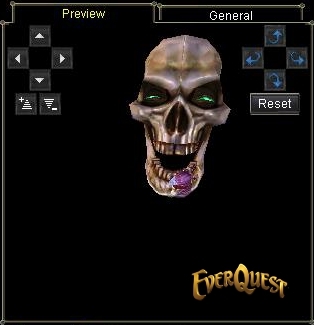 I recently discovered that EverQuest 2 is free, so I installed it and went into the game and it immediately froze up on me. In order for me to get out of that I had to hit the reset button on the front of my tower to reboot the computer. I figured it was slow because I had just installed it, but that wasn’t the case at all because I tried to run it again and it froze up again. That told me that I definitely need more memory for my computer. I have been doing research over the last few days to find the most inexpensive memory because I just don’t have a lot of money to spare right now. My go-to website used to be TigerDirect, but when I discovered how quickly I got my orders from NewEgg, that became my go-to site, but they are too expensive for 4GB. A friend told me to try the Fry’s Electronics website so I checked it out and they are way cheaper than NewEgg. I did go to TigerDirect and they aren’t too expensive, but I don’t want to have to wait a whole week when Fry’s is in Los Angeles and I could get it as quickly as NewEgg. My ideal brands are Kingston and PNY, but they don’t have any available that will ship out immediately. Fry’s Electronics also had some other less expensive brands that I would have liked, but shipping was unavailable, so I chose the Patriot Extreme Performance PC2-6400 (800MHz). My motherboard will accept PS2 memory up to 8GB. I can’t afford to buy 8GB so I am buying 4GB for now and then I will buy another 4GB later when I can afford it again. What I love especially about this memory I am buying is the heat sink. The memory I have doesn’t have that. This is the description of this memory, and it really fits for what I use my computer for too. I think that “Extreme overclockers, gamers, and PC enthusiasts” really fits me lol. Another issue I have with memory is Hulu, YouTube and Facebook games. I don’t really care too much about Facebook games, but it is fun to play them every so often, you know? I can’t play them at all because they freeze up my computer. I will order this memory now and then see how it works out. I really hope that it’s as fast as it says it is, and it if is fast, I may just forego buying the other 4GB, but can you imagine how much faster it will be with 8GB? I actually would love to see how much faster it would be so let’s hope I can afford that next month. I will let you know how fast my computer becomes when my new memory comes. I can’t wait! Update: I ordered it early this morning and it has already shipped. WOW that was fast! I don’t have a tracking number yet, but if they ship it from Los Angeles, I should get it by tomorrow, that is if the mail comes on the 4th of July. Update 7/13/2012: I called Fry’s a couple of days ago asking them why the tracking isn’t working and where my package is since I bought this on the 3rd, but they told me there was a tracking number, it just wasn’t listed yet because it wasn’t working on the UPS website yet. I told the woman who I spoke with that it’s supposed to come USPS, but she said they ship it out with UPS, then they hand it over to the post office to send it to me. Well, I was finally able to check the shipping on the UPS website, and the tracking says it should be here on 7/16/2012, but we will see if that is true on Monday, I won’t hold my breath. My reason for buying this through Fry’s instead of NewEgg or TigerDirect was that I thought they were shipping it from their LA store, but they are really shipping it from back east, which wasn’t what I had thought. If I knew I would have to wait for 2 weeks for my memory, I would have gone with TigerDirect which only takes 1 week. They had the same prices, NewEgg was more expensive. So this is the first and last thing I will ever buy from Fry’s. I wanted to buy the other 4GB from Fry’s with my next check, but I think I’ll just live with 4GB. 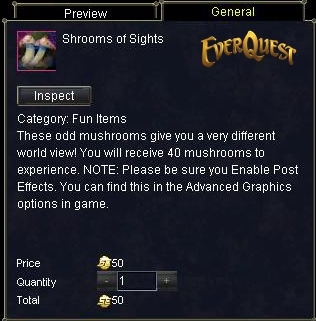 I have been having a bit of fun in EverQuest over the last couple of days. I haven’t really had much time to play since we have been so busy trying to install the new floor, so when I do get to play, I don’t really know what to do. When I got in the game yesterday, I decided to see how many Station Credits I had (you get a specific amount of credits every month as a subscriber) so I could buy something fun and I found a few items. First thing I bought was an illusion for myself (picture above) which is of a burning Nekhon. As you can see, it’s a dragon like creature that walks on legs like a minotaur (or bull) but has flaming wings. I get two icons in my spell icons box, one is the illusion and the other is the added benefits of the illusion which burns creatures that strike me and levitation. It looks awesome, especially when I’m fighting, but he looks so funny when he runs. The first thing was a Nightmare Skull. That is a pet illusion; you cast it and your pet turns into that. The only problem was I forgot that I don’t have a pet, I have a familiar, he isn’t considered a pet. A pet fights the monsters (mobs) for and/or with you, but your familiar only gives you added benefits like clarity. So, I wasted 200 station credits. I would be better off buying that for my necromancer EvilXanapus. 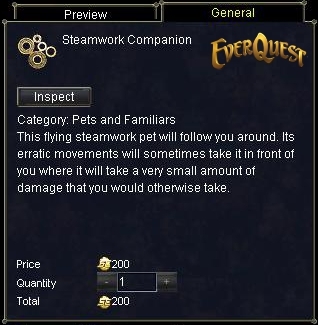 I still wanted a new pet/familiar so I found the Steamwork Companion. He is a little floating robot which gives me levitation and when I am fighting a mob, he steps in front of me and takes some of the damage. He stays around for 5 hours which is the same as my regular familiar, so he keeps me floating for a long time. I mean, he’s not that useful, but any damage mitigation is good so I don’t mind. Plus he’s cute to have follow me lol. The last thing I bought was Shrooms of Sight. It’s basically drugs lol. They have had alcohol in the game forever, but this is different. Although it’s not what I thought it would be. I thought that I would be seeing some strange stuff going on that nobody else could see, but all it does is it turns the screen different colors for a minute or so. It’s really actually kinda lame lol. It was cheap so no harm done. So here is me in my regular gnome form with my Steamwork companion and my bloodbone protector mercenary. He fights all of my battles for me. He isn’t considered a pet because he is a paid mercenary and he goes in the group. I would love it if he were a floating skull, but I like him as a bloodbone skeleton, especially when I am using the Nekhon illusion. This picture was taken in the Western Wastes on the Velious continent at the zone to Siren’s Grotto. I have been going there to fight for Deepwater Ink for alchemy with my Vah Shir Shaman character named Painen Dabum. As a level 77 wizard I don’t get any exp killing the mobs there, but it’s quick money and I get the alchemy ingredients I need in a timely manner. And believe me, there is a lot of money to be made there. I get tons of gems that sell for a couple hundred plat each. I can fight in there for a couple of hours and make 1000 – 2000 platinum. I go there for the alchemy ingredients, not the money, but it helps, especially since I have to pay the mercenary 35p every 15 minutes and the potions I make in alchemy cost money to make. I am making the potions to sell back to the merchants and to get my alchemy skill up. Although, I would do better with the higher level alchemy potions, but those ingredients are foraged and it’s boring to sit in the Dreadlands with my druid for hours upon hours twiddling my thumbs waiting for the forage button to let me forage more. But I digress, I am having a lot of fun playing the game again, even though I am playing by myself lol. I can’t wait to get the burning Nekhon and the floating skull for my necromancer, I think that would be awesome to look at. It won’t be any time soon because they don’t give me very many station credits every month. If I really wanted those things, I’ll have to pay them real money for more credits and I just don’t want to spend any more money than I already give them every month.